Organized as a call for the U.S. government to pull military from border communities and respect the human right of migrants and refugees to claim asylum, the event gathered hundreds of people, with many being faith leaders from all backgrounds. 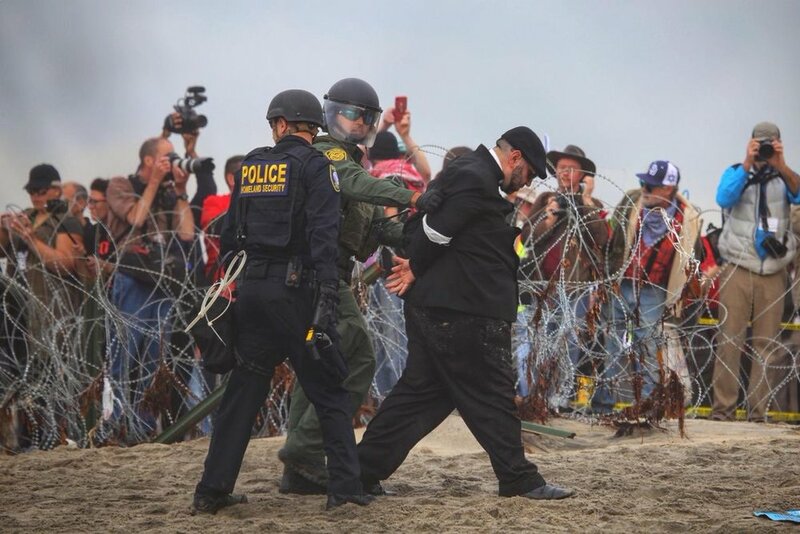 The demonstration took place at San Diego's Border Field State Park, an area directly bordering Tijuana, Mexico. This comes as the second rally that has caused tensions to rise on the San Diego border since the arrival of the Central American caravan in November. The first confrontation, following another peaceful protest in San Ysidro, CA on November 25th, led to a five-hour closure of the world's busiest border, as well as the U.S.-sanctioned act of mass tear gassing along the port of entry. The demonstration Monday was meant to launch a national week of action called "Love Knows No Borders: A Moral Call for Migrant Justice," which falls between Human Rights Day -- on Monday -- and International Migrants' Day on December 18th. Almost ten-thousand troops are currently deployed across the United States-Mexico border. With an extremely limited amount of claims being processed daily, thousands of asylum-seekers are still facing weeks or months in crowded refugee camps set up in Tijuana, Mexico. INTERVIEW: Meet your new favorite local music duo, R.A.D.